If we can't warm it up, we'll at least try to keep you so intellectually engaged that it'll seem like spring arrived in a blink. There is a dance ball over the fire for NPC dance/skating. There are book boys, satyrs, snow fairies and ice demons loaded for you winter celebration delight. We plan to leave the circle in place until Candlemas in Feb.
Wednesday night will be the last Moonlight Safari launching from the Nook. We will still have an evening hypergrid event but it will no longer be a mirror of Safari and they will no longer be scheduling events for us, so given that our original name was a hat tip to all they do for us, the name will change to Hypergrid Nights to reflect that we are no longer a jointly managed event. We still love and support HG Safari and you will see me on safaris. We'll still network and share our finds for great region visits with each other. This week we will be visiting Senchai Library in Kitely where Shandon Loring will be doing a reading of A Christmas Carol. Put a swim suit in your suitcase or wear it under your winter woollies because after that I'll be hopping to a beach party and anyone who wants to join me is welcome. We'll be taking a break from our grid hopping for the holidays as next Wednesday is Christmas Eve and the following Wednesday is New Years Eve. Starting January 7th we'll launch again with a Yacht party in the water regions at Mike Hart's Next Reality grid. Same time, 9 pm EST. Same launch place world.narasnook.com:8900 Greyville. We will also switch from three scheduled hops a night to one hop, dropping that time commitment from three hours to one, though I expect some of you will want to keep playing past the official timed visit and that will be fine. Our focus will likely shift a bit to reflect the unique interests of our group and to activities that are friendly to our US-based team members time zone. 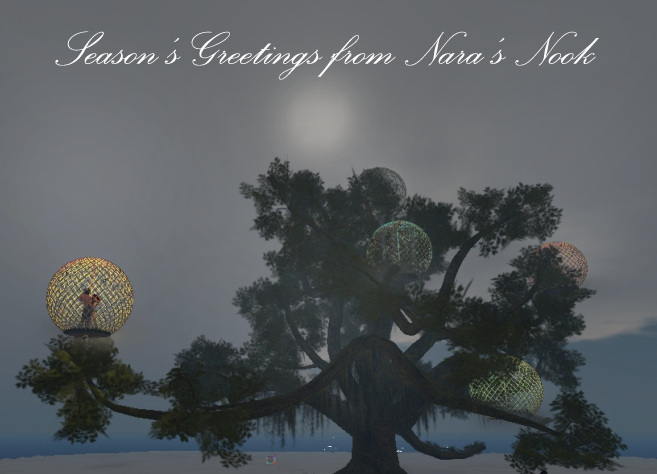 If you have a region you'd like us to spotlight, contact Nara Nook at Nara's Nook. You can reach me as Nara Malone on G+ and @nara_malone on Twitter. Author Shannan Albright will be leading a writer's workshop with the goal of finishing a book in a year: From beginning to end learn the tips and tricks to put that novel in your head on paper. This year-long workshop covers from the very basics to advanced tools to craft your book. Then covers the aspect of marketing and publication. From the dreaded synopsis to branding. How to get your book in front of readers. This workshop is for all from beginners to advanced. 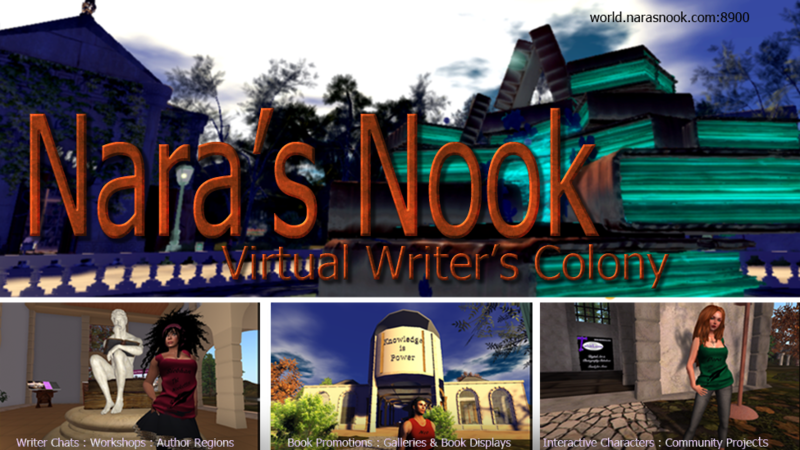 Participants can interact at in-world meet-ups and/or via forums on the Nook website. I will be leading a series of NPC workshops for Hypergrid University to be held in the Pandora region of Nook grid which contains all our demo projects on using NPCS. The workshops will be every other month on the 3rd Sunday at noon grid time. Watch our calendar link to keep up with the workshop dates. The first is January 18th and will cover basic NPC creation and animation. I will have everyone looking at their first animated NPC in under five minutes. 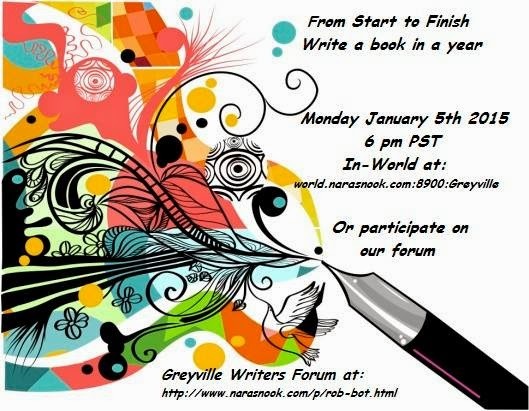 The third Sunday of each month remains our workshop Sunday, and we are lining up other events to fill up that schedule, including a Flash Fiction workshop from Siobhan Muir and another workshop on Cross Promotions and Social Networking--skills mandatory for authors but something the metaverse residents could use as well. If you or someone you know would be interested in leading a workshop at the Nook, catch up with me. Topics of interest users have indicated they would find interesting are making clothing, animating, basic building.